A gorgeous week of tree climbing in the spring sunshine in Appley Park, Ryde and a private climb in the lovely grounds of Ryde House. A great week for Goodleaf! Look at that blue sky – what an amazing few days of tree climbing! 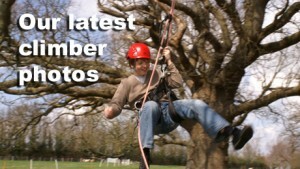 Thanks to all our Goodleafers for coming tree climbing and bringing the sunny weather, we had a fabulous week! Despite the weather’s best efforts at the beginning of the holidays we’ve had a fantastic start to our tree climbing season! Can you make a good cup of tea?! We’re looking for staff for this season, click here for more information. Thanks to all our tree climbers who joined us this week and made the most of the stunning autumnal weather, we had a blast!